A collection of Adelie penguin colonies located in the Danger Islands off the Antarctic Peninsula, as seen from the Landsat 8 satellite. Differences in the spectral profiles (essentially the color) of materials on the ground allows scientists to distinguish what is what. Work by a team that included Youngflesh developed techniques to distinguish what penguins are eating from satellite, using the spectral profile of the penguin guano. First and foremost, we show that we are now able to determine what penguins are eating from space. 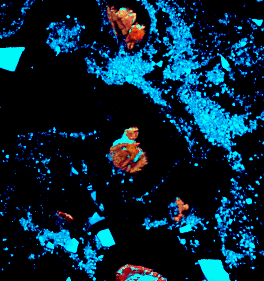 This is done by linking the spectral profile (essentially the color) of penguin guano to what these birds are eating. Large amounts of penguin guano build up at penguin colonies, which can be seen from space. The ability to derive this sort of important ecological information from satellite sensors means that we can study dietary patterns on scales that were previously intractable (continental, multidecadal). Interestingly, we found no obvious trend in diet over time, despite changes in the physical environment. This is a surprise since the abundance and distribution of Adelie penguins has changed dramatically over the last 40 years and we had hypothesized that a shift in diet may have played a role. Spatial dietary patterns, however, suggest that in some areas experiencing population declines, penguins may have relatively few options for switching among prey resources. This is the subject of ongoing work. These findings are important for our understanding of how the Antarctic ecosystem functions and how this system might change in the future. Given continued changes in the physical environment and a growing krill fishery in the region, changes are likely to be seen both in the availability of penguin prey and penguin populations themselves. Tools such as these will be important for the management of the Antarctic ecosystem which is often considered among the most pristine areas in the world. Understanding how ecosystems are responding to global change requires making inference at large spatial and temporal scales—satellite platforms are ideal for addressing these challenges of scale. Landsat affords scientists the ability to look at ecological patterns on scales that would otherwise be impossible. We were able to obtain imagery for the all relevant areas of the Antarctic—a massive body of land with nearly 24,000km of coastline. While dietary studies have been conducted at isolated sites around the Antarctic in the past, characterizing diet over nearly the entirety of the species range would be nearly impossible without the help of satellites. Landsat also provides a usable historic record dating back to the 1980s, allowing us to look at how ecological processes are changing through time, which is particularly relevant given the rate at which the physical environment is changing worldwide. 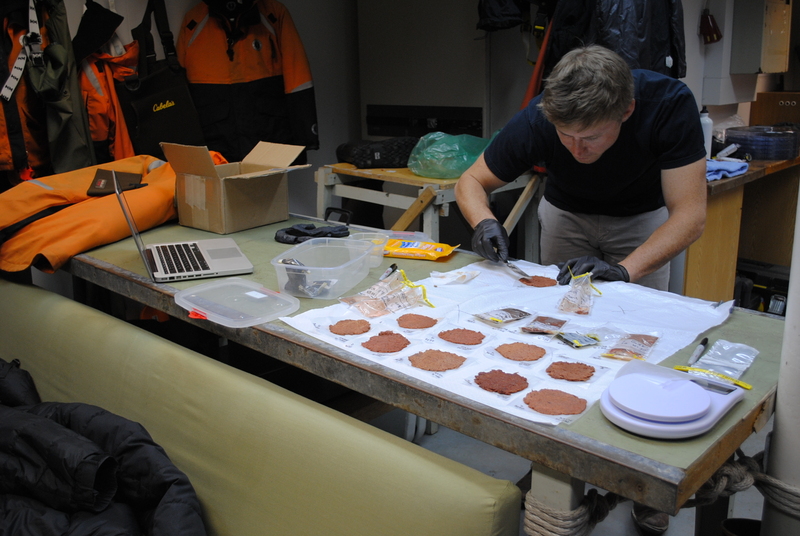 Youngflesh processes penguin guano samples aboard a ship in the Antarctic. Each sample underwent spectral and chemical analysis, which was ultimately used to determine what penguins are eating from satellite sensors. This work was funded by a NASA Earth and Space Science Fellowship (NESSF graduate fellowship) – grant #NNX16AO27H. Casey conducted this work as a graduate student in Dr. Heather Lynch’s lab in the department of Ecology and Evolution at Stony Brook University. This entry is filed under Carbon and Climate, Ecosystems and Biodiversity, News, Q&A.